Kevin Pietersen has said he hopes the furore surrounding his international future can be sorted in time for him to tour New Zealand in February. He tweeted: "Hoping all is sorted & I'm on the New Zealand tour in February." 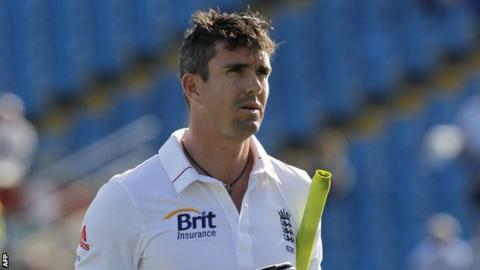 Test and one-day captain Alastair Cook had stated earlier this week he was positive about Pietersen's return. "Time hopefully will be a healer and we will be able to move on, but the issues will have to be resolved," the 27-year-old said. "If the issues can be resolved, Kevin has said he is available for selection, but at the moment that can't happen. "Meetings are still going on in Sri Lanka at the moment." England and Wales Cricket Board (ECB) chief executive David Collier and England Cricket managing director Hugh Morris have spoken to the Surrey batsman in the Asian country, where he is covering the World Twenty20 for television. If Pietersen can resolve his differences in time for the trip to New Zealand, he will face the Black Caps in three Tests, three one-day internationals and three Twenty20s. England arrive on 29 January and, after the limited-overs series, the first Test starts on 6 March in Dunedin. The second Test begins in Wellington on 14 March before the series culminates in Auckland. The timing of the games ensures Pietersen will be able to feature for the Delhi Daredevils in the Indian Premier League, which begins on 3 April. This commitment was once part of the dispute with the ECB, but Pietersen has since said he is willing to return from the tournament early. Cook, who has also met Pietersen and been involved in other meetings, admits England's hopes of winning the Test series starting in November have been hit by Pietersen's absence. "That is a given," said Cook. "Kevin has proved in all conditions around the world that he is a world-class player. His record suggests that in all forms of the game. "It is a sad circumstance. He will be missed but it gives opportunities to other players and they can do well. There is no reason these guys can't fill the gap there." The uncapped pair of Nick Compton, who averaged 99 for Somerset in the County Championship this summer, and Yorkshire's Joe Root were called up to fill the void left by Pietersen's absence and former captain Andrew Strauss's retirement. Six years ago, Cook was called out to India as a late replacement for Marcus Trescothick and scored a century on his debut. "We are going on this tour to win. We have got to look forward now as a side and not back," added Cook. "Just like when Tres [Trescothick] came home from India in 2006, he would certainly have been missed. "The best advice I can give is that the game doesn't change. Sometimes as players you put on an England shirt and think you have to play a different way, and you don't. "I haven't seen too much of Joe Root play but I have heard glowing reports and everyone talks about his temperament. One thing you definitely need as an international cricketer is a good temperament." Cook later spoke to BBC Radio 5 live after being named one-day international player of the summer at the Professional Cricketers' Association awards ceremony in London. Asked about the tour of India, he said: "In Pakistan and Sri Lanka we didn't win but we proved we can get 20 wickets, so as a captain that's quite encouraging. "Now, as a batting unit, we all know how important first innings runs are in India and we've got to go out there and bat for huge periods of time. We've certainly got the talent in the squad to do that, it's just hopefully we can get used to the conditions and prepare to bat six or seven hours for a hundred. "The new guy coming in at the top of the order, whoever it may be, I've got a big role to try and help him into Test cricket, it's not an easy position to fill but the talent's there and it's a great opportunity." England seamer James Anderson, also interviewed at the ceremony, said: "When I started playing there were are a lot of senior players and it was quite difficult to integrate. Most of the players in the team now have had experiences of that, so we try and make it as welcoming as possible." Speaking about the India tour, the 30-year-old added: "It can be a difficult place to go, the new ball is crucial, you've got to take early wickets. "There is a misconception that spinners take all the wickets, but there is reverse swing that you can use and there is still a huge job for seamers. If you over-attack you can get punished, especially with [Virender] Sehwag and [Gautam] Gambhir, so you've got to get the balance right." England Test squad for India: Alastair Cook (Essex, capt), James Anderson (Lancashire), Jonny Bairstow (Yorkshire), Ian Bell (Warwickshire), Tim Bresnan (Yorkshire), Stuart Broad (Nottinghamshire), Nick Compton (Somerset), Steven Finn (Middlesex), Graham Onions (Durham), Eoin Morgan (Middlesex), Monty Panesar (Sussex), Samit Patel (Nottinghamshire), Matt Prior (Sussex, wk), Joe Root (Yorkshire), Graeme Swann (Nottinghamshire), Jonathan Trott (Warwickshire).